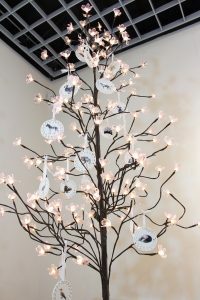 This is a plastic/wire/LED holiday tree adorned by ceramic ornaments featuring photographs or hand drawn illustrations of various animal species that are extinct, endangered, or have populations declining. The photographic images are from Rodriguez’s personal travel photos taken on a trip to the Galapagos Islands in 2016, and the extinct animals are illustrations hand-drawn by the artist. The back of the ornaments reveal statistics about the particular species featured and also consistently list humans as the cause of their eventual, if not already, extinction. This piece exists in an uncomfortable space in between memorial and holiday, environmental advocacy and tourism, conservation and consumption – a conceptual space the artist is currently exploring in other works as well. The piece was started while Rodriguez was an artist-in-residence at The Studios at MASS MoCA at the Massachusetts Museum of Contemporary Art and was exhibited for the first time at La Galería at Villa Victoria Center for the Arts, Inquilinos Boricuas en Acción in March 2017.